Jacob Bahle is my 3rd great grandfather, or put another way, he is my grandfather’s great grandfather. He was born in Wurttemberg, Germany probably around 1831. In 1855, he emigrated from Germany to the United States and five years later, applied for citizenship. 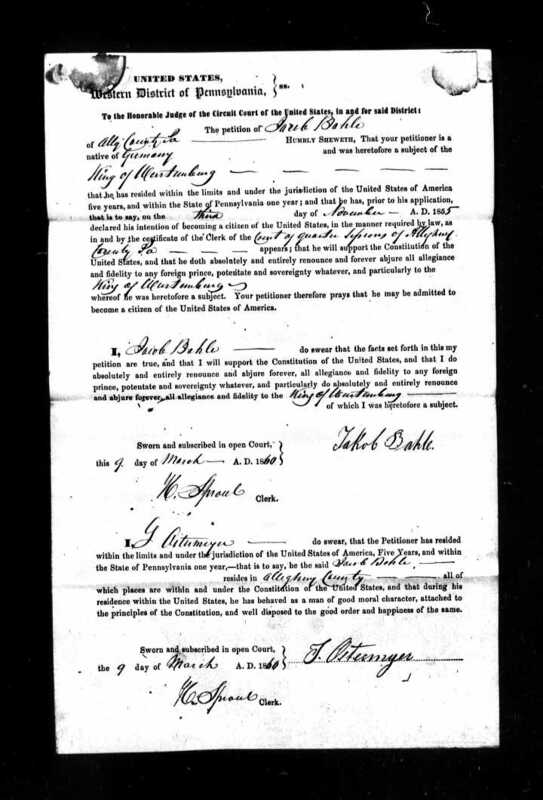 This document is his petition for naturalization, signed on 9 March 1860 in Pittsburgh, Pennsylvania. This petition for naturalization is a state document, not a Federal document. Interestingly, prior to the 14th Amendment in 1868, citizenship was with the states, and not handled at the national level. Pennsylvania maintained three Supreme Court districts where naturalization petitions were received. They were the Eastern District in Philadelphia, the Southern District in Chambersburg, and the Western District in Pittsburgh. It was the Western District where Bahle filed his petition. National Archives and Records Administration (NARA), Washington D.C.; Naturalization Petitions of the U.S. District Court, 1820-1930, and Circuit Court, 1820-1911, for the Western District of Pennsylvania; NARA Series: M1537; Reference: (Roll 025) Jan 3 -Sept 27, 1860.